Hello all. 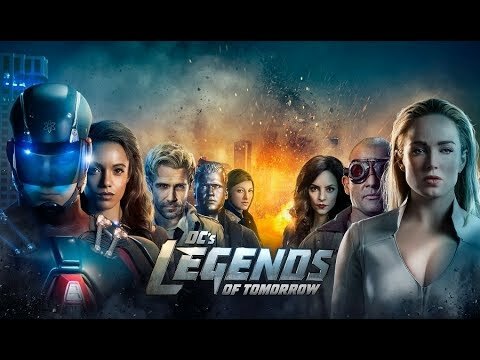 My review of the latest episode of Legends of Tomorrow (Wet Hot American Bummer) is here. Hope you enjoy, comments always welcome. Right off the bat, I’m going to say that I think this was the best episode of Season 4 so far. Alerted by Gideon to goings on with magic, Sara gets the team together, including Ava and make their way back to the days of 1995. They arrive in Camp Ogawa, there to figure out the magical being that is taking away the kids from camp. They’re up against the Shtriga, child snatching witch who drains the life from the victims. To blend in as part of the camp, the Legends (Sara, Ray, Ava and JC) are kitted out and take their places as Counsellors. Constantine takes the huff as he can’t wear his tie, Ray is over the moon that he is taking this on, Ava struggles to adapt and Sara is also in her elements as it brings memories of her childhood back. Anyway, as with all Legends adventures, they fall in 3 parts, so will deal with them one by one. First off, the main part of this weeks’ is as above. Without initially knowing, they are up against the Shtriga, a crone of such nightmares that you wonder how they’d bring it to the screen. Introduced to the seemingly evil Paula Cooper and Chad, who acts in a way that we now know how Ray was at summer camp, it does seem obvious that nasty Paula is going to be the villain of the piece. As they are acting as Counsellors to the kids at camp, the Legends all have different ways of dealing with the kids; Sara how anyone in her position should, Ava in a very military style, Ray as excited as he was a young one and John as the rebel of the group. It makes for great scenes with the pairings (Ray/JC & AvaLance) as they try and garner information from the kids at to what it going on at the camp. These scenes do give us some great character work from the team. As the story goes on, without the camp kids coming out with any information to help them, Constantine comes up with the idea of concocting a potion to turn Sara and Ava in to teenage girls, helping to gain the trust of the girls they have been looking after and finding out all they need to know about the disappearing kids. Working out well, AvaLance make their way to the lake where they are stopped by Paula. Believing her to be the witch, Sara knocks her out cold. Chad also makes an appearance here wondering what is going on and tells the Avalance kids to go with him. However, thanks to the enquiries on the Waverider (more on this below), they are notified that in fact, Chad is the Shtriga, not Paula. Despite them having the appearance of 2 teenage girls, Sara and Ava give Chad/The Shtriga a good kicking, sending the demon back to where it belongs. Sara and Ava kiss as the potion wears off and they return to their natural state. 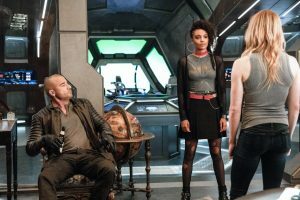 On the Waverider, Zari and Mick are left guarding Charlie. Still imprisoned, she somehow manages to make a switch and leaves Zari in the cage and while she tries to escape, albeit without success. Mick finds her and sends her back to the cage but not before she makes comments about his own ways and his past that she quite clearly has an idea about. They begin to talk and realise they have more in common than they may think, even more surprising is that Mick manages to talk Charlie around in to believing (ok, maybe not fully yet) that the Legends are friends. Gaining that trust, Charlie coughs up some intel on the Shtriga which, in turn (and as alluded to above) leads to the capture of said being. In return for this, Mick makes the decision to release her from her prison, much to Zari’s disdain. However, one makeover later, and despite being thought missing, Charlie reappears, having made the decision to stay with the team as they’ll need her help on future missions. The 3rd thing that this episode gives us is some wonderful character development for Ava. From the difference in how her and Sara deal with the camp kids. Unfortunately, her militarian ways don’t go down well with the kids, ultimately, in her becoming the victim of a prank. This does hurt Ava, she has no childhood to remember and makes a point of telling that to Sara. It’s an emotional part of the episode and one that really gives us some insight in to Ava’s character. You really feel for her. 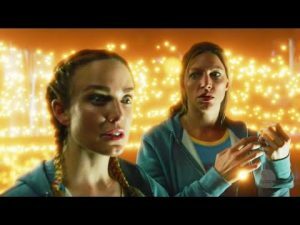 With the magic of the potion turning herself and Sara in to teenage girls, it was wonderful to see Ava get to experience of having some sort of childhood and, despite initially struggling, you can see how it makes her feel. No wanting to lose another child, you can also throw in the hero that is John Constantine, giving some of his own life-force to one of the kids he and Ray find, we see that he is not just about himself. He can come across as quite selfish but here, there is no sign of that whatsoever; and it’s not just giving some of his life-force away, he also tells big hearted Ray to stay away from him as he is nothing but destined for a life in hell and his time is running out. Matt Ryan is currently my favourite actor from the show and performs to a seriously high level each time. 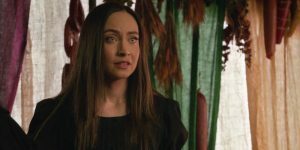 We also get an appearance from Nora Darhk right at the end, a little teaser that she is about to become a season regular. While I enjoyed seeing her character, I hope that what we saw, won’t be how she will be portrayed as the season goes on. She came across as a little weak and I don’t think that is what Nora is about. Suffice to say I’m sure it will all be good once we get in to it. I want to read Rays’ birdwatching journal – possible merchandise release there? And that’s that. I’d love to read your own views of this episode so please feel free to leave any comments below or on any of our social media pages, listed below. Hope to hear from you.